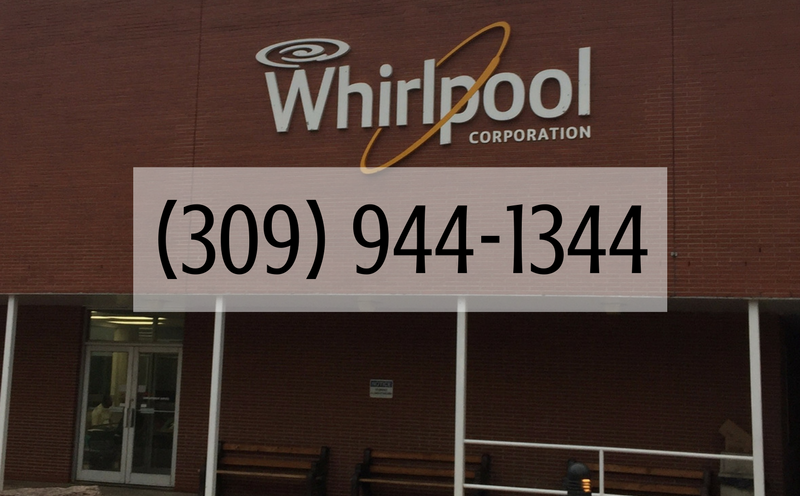 Whirlpool Corp. is the only full line appliance manufacturer based in the United States. They operate 9 US manufacturing plants in 5 different states. Our staff is so lucky to be located just a short drive away from one of those plants in Amana, Iowa. We have been able to participate in a product training and plant tour now for the past few years. Please excuse our attire for the factory tour, this is not a fashion blog folks. The plant we visited last week is home to all of the bottom-mount refrigeration operations as well as built-in refrigeration. This 2.1 Million square foot facility is huge! We clocked 1 3/4 miles on our factory tour alone. The water treatment facility for the plant also supplies the entire Amana Colonies with water. 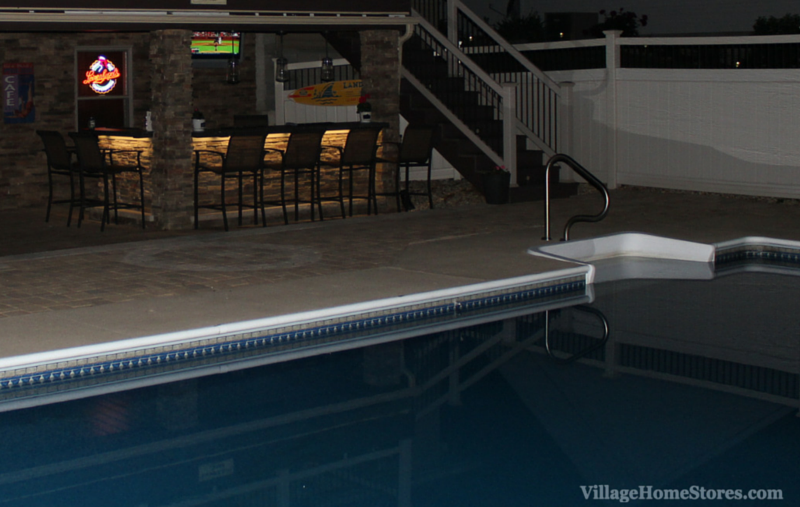 Whirlpool provides back-up power when needed for the region as well. This Amana, IA plant produces roughly 6,400 refrigerators a day! Pardon our pun but that’s pretty cool! First of all, say hello to Seth (shown above on left). He is our newest member of the Appliances staff and was able to join us this year for this Whirlpool training and tour event. In addition to our tour, we received product training on many new models and features being introduced in laundry and kitchen appliances. 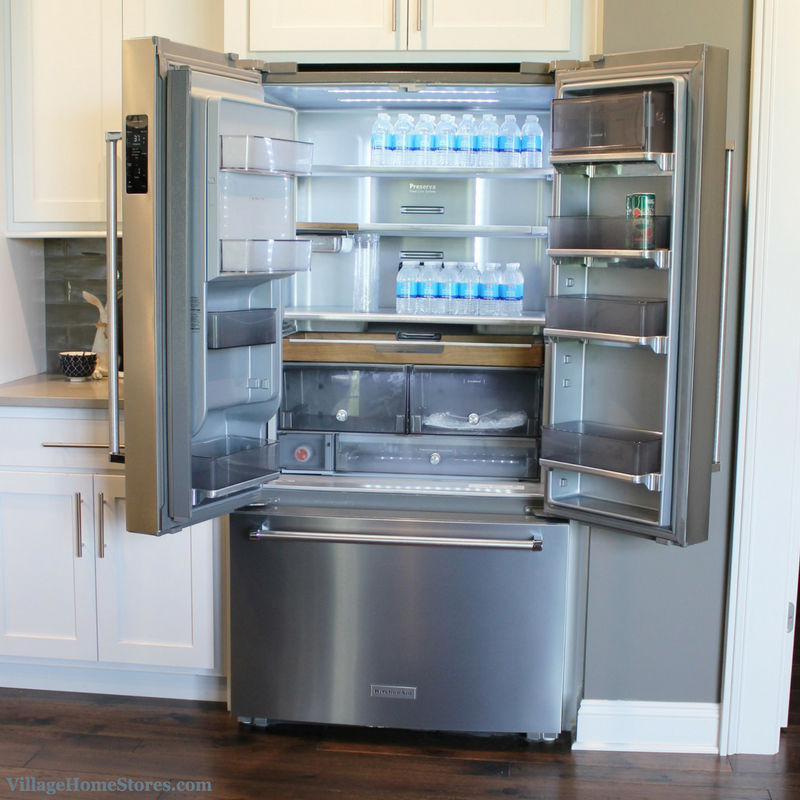 Shown below is one of those new features called an “under-shelf prep zone” which utilizes an un-used space for for marinating or other storage needs in this new refrigerator model. 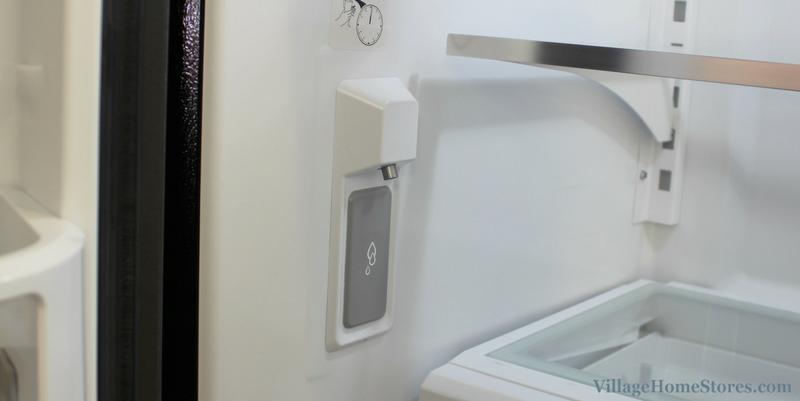 This same new refrigerator model includes TWO ice makers, each with the ability to produce 4.6 lb.s of ice. Just get a text that you are entertaining guests after the work day? No problem! You can program to have plenty of ice by the time you get home right from your mobile phone. 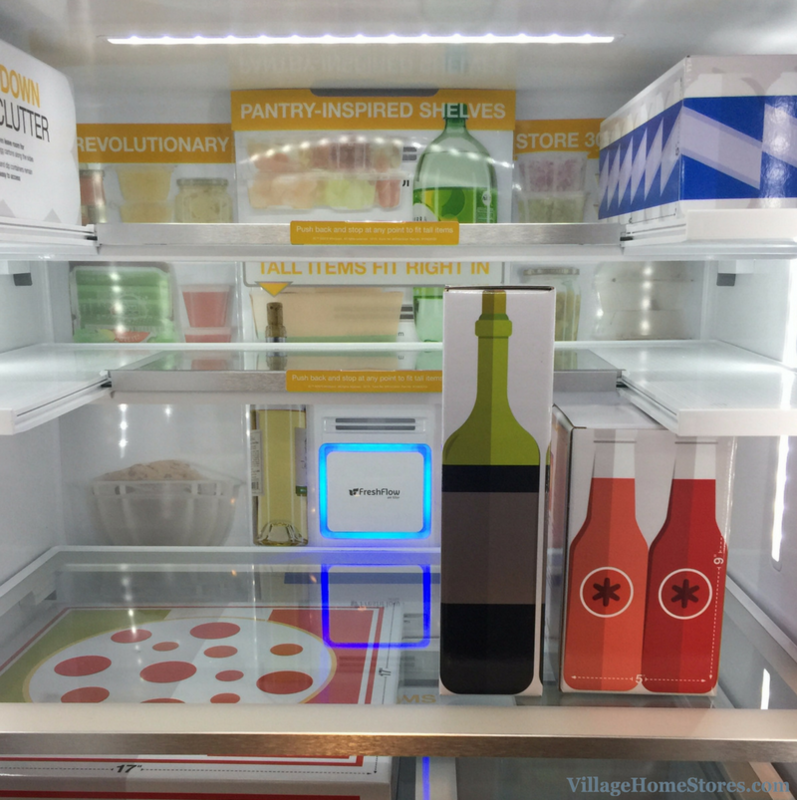 We saw so many amazing new products! Many of these models are already at our store or on their way. View this current US Manufacturing Map from Whirlpool showing the locations and products represented in the 9 manufacturing plants in the US. 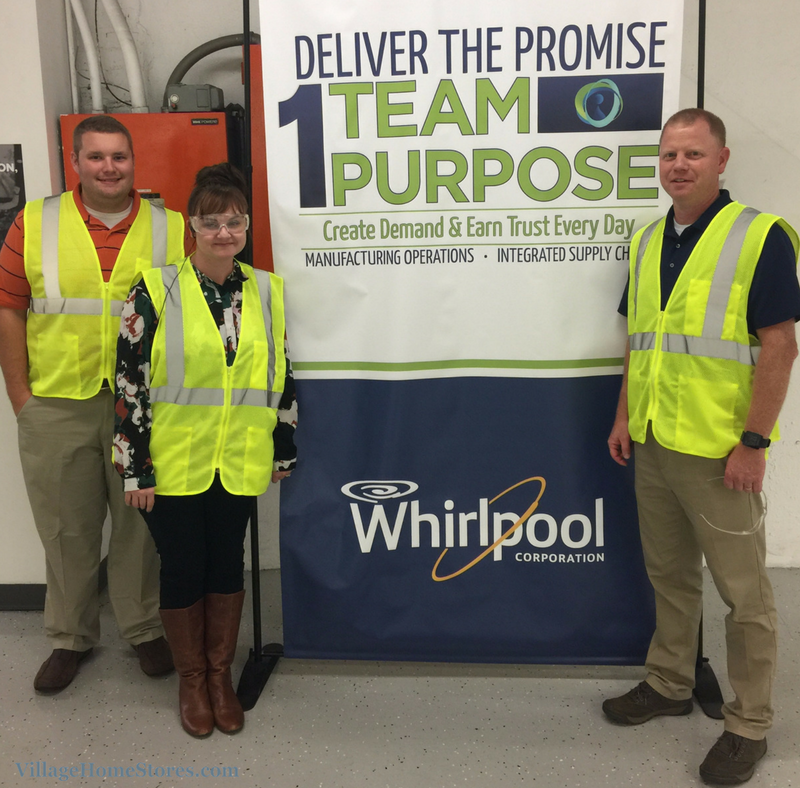 Whirlpool Corporation currently employs 22,000 manufacturing workers. Whirlpool truly believes that “there is no right way to do a wrong thing” and has committed to this opportunity to stay in the US. 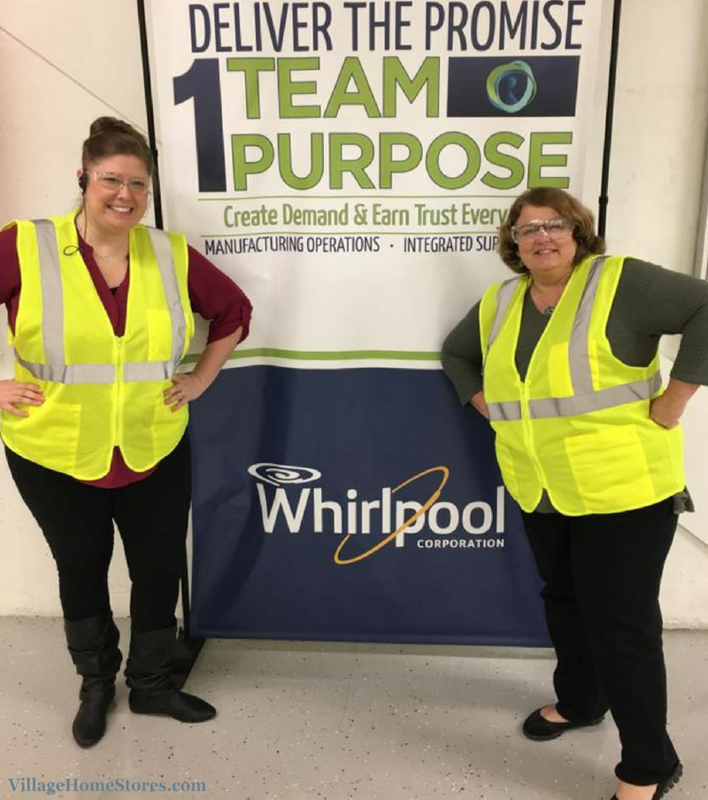 For example, instead of moving freezer manufacturing to Mexico or China, Whirlpool has recently purchased an vacant factory in Ottawa, Ohio keeping thousands of jobs in Ohio and allowing another category of product manufacturing to remain in the US. No complaints that we were greeted the morning of training with cupcakes alongside our breakfast (see our Instagram post on the right when we caught Rob with a cupcake at 8am). 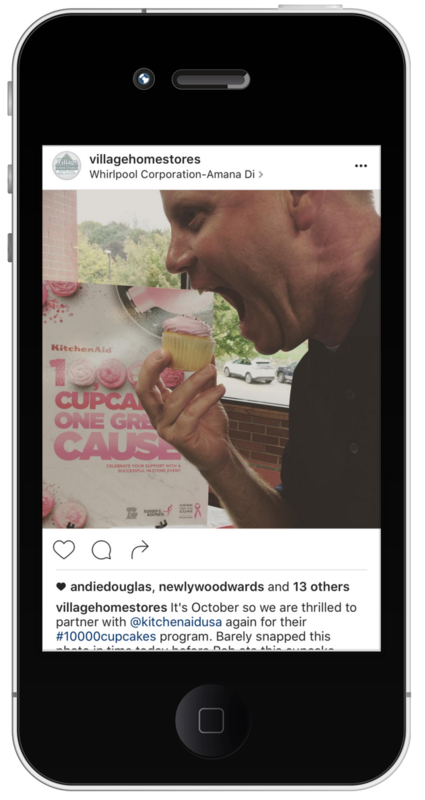 We were thrilled to hear that KitchenAid is hosting their #10000cupcakes campaign again this year to benefit Susan G. Komen. You can help make a difference for this cause! Share a photo or video with @KitchenAidUSA on Instagram or Twitter and include #10000cupcakes and #donate. For every original photo or video posted KitchenAid will donate $1 to support the fight against breast cancer, up to $10,000. Join us in store Thursday October 27th from 4:30-7pm as part of our annual “Witches Night Out” celebration and decorate your own cupcake to snap a photo of. 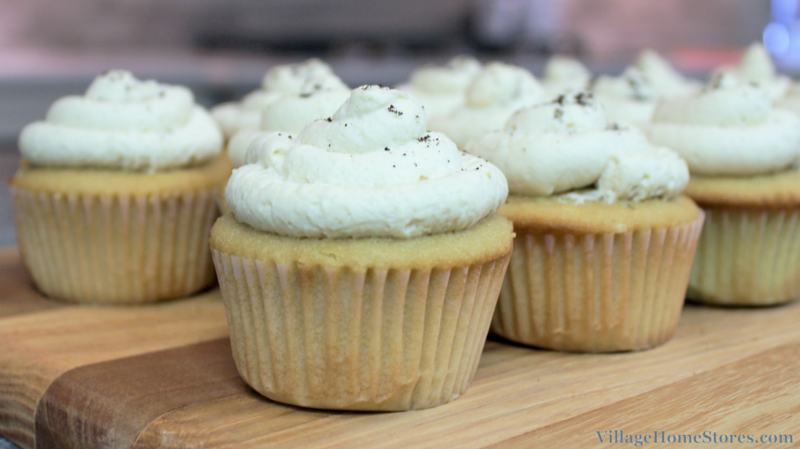 Be sure to follow us on Instagram here to see our own cupcake posts. 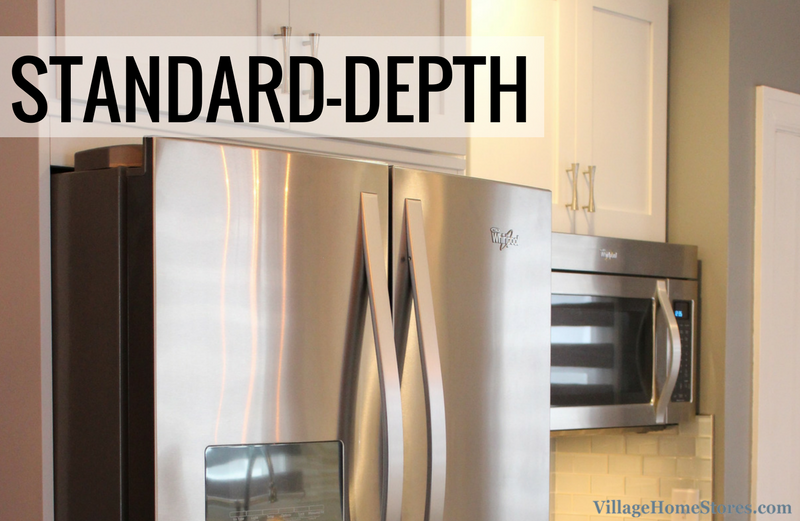 Do you have a recent model of a Whirlpool, Maytag, Amana, or KitchenAid bottom-freezer refrigerator in your kitchen? 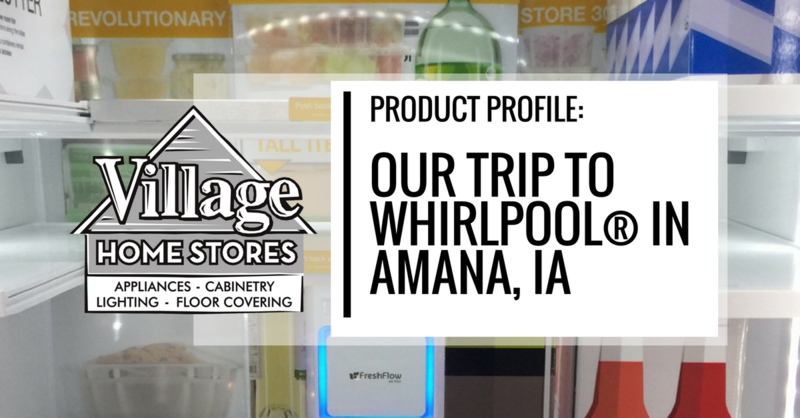 That unit was made just a short drive past Coralville in Amana, Iowa and we had the privilege to see the smiling faces that assembled it for you.Read about our trip to Amana last year here at this link. If you are interested in purchasing appliance brands that help support jobs in our own country, our expert sales staff is ready to help find the right product and features for your lifestyle and budget. Shop our products online anytime here on our website. 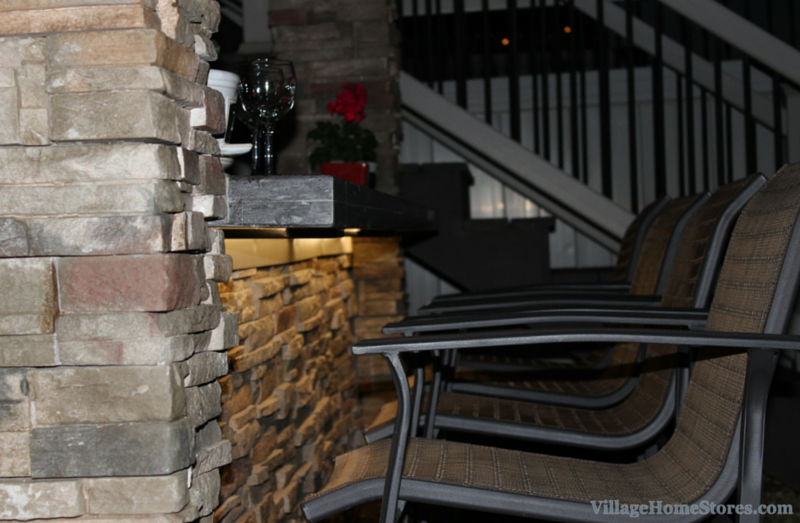 Then give us a call or stop in the store to experience the award-winning customer experience at Village Home Stores. 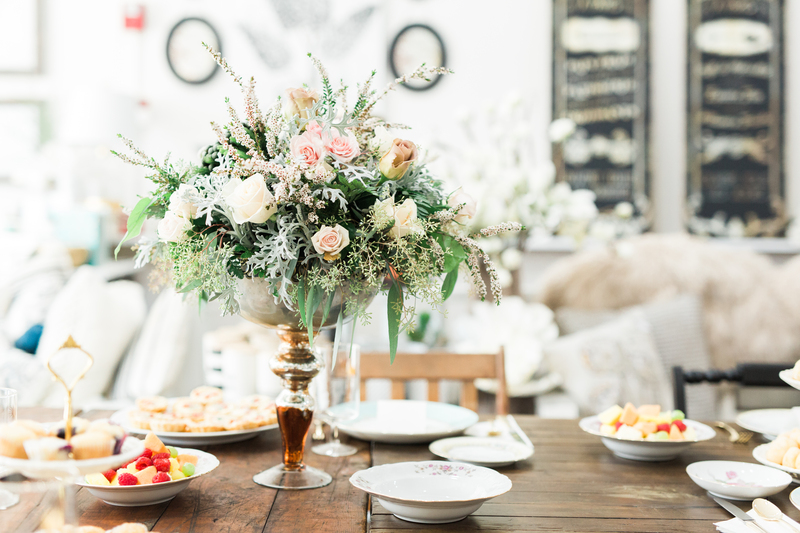 A few weeks ago we had the pleasure of getting an invite to a Tastemakers Tea to meet, mingle and discuss trends throughout the Home Decor, Fashion, and Floral industries. These industries are closely knit when it comes to trend and color forecasting. 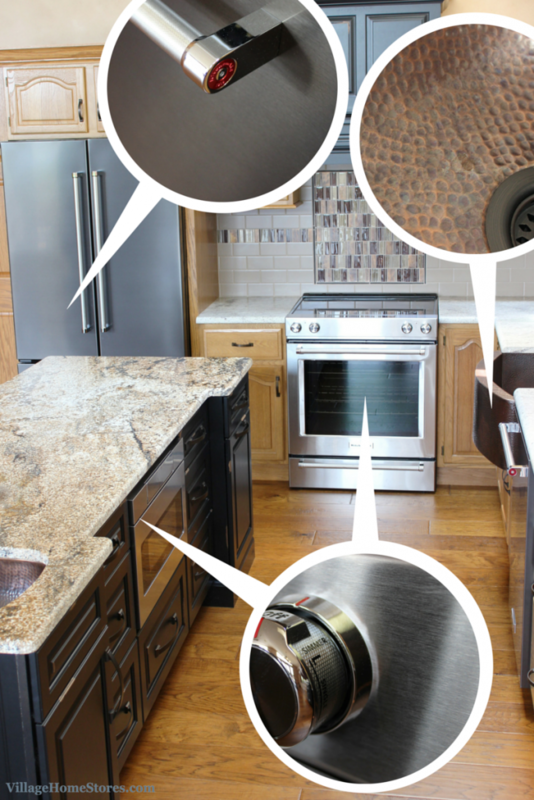 Materials, color palettes, and details all pour over into the Kitchen and Bath industry. 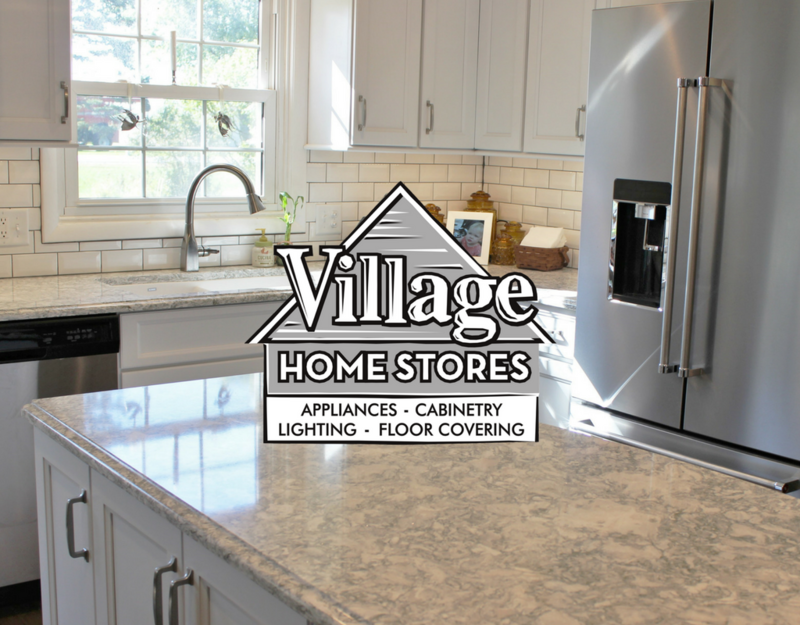 Village Home Stores offers expert design and material selection for your new or remodeled home. 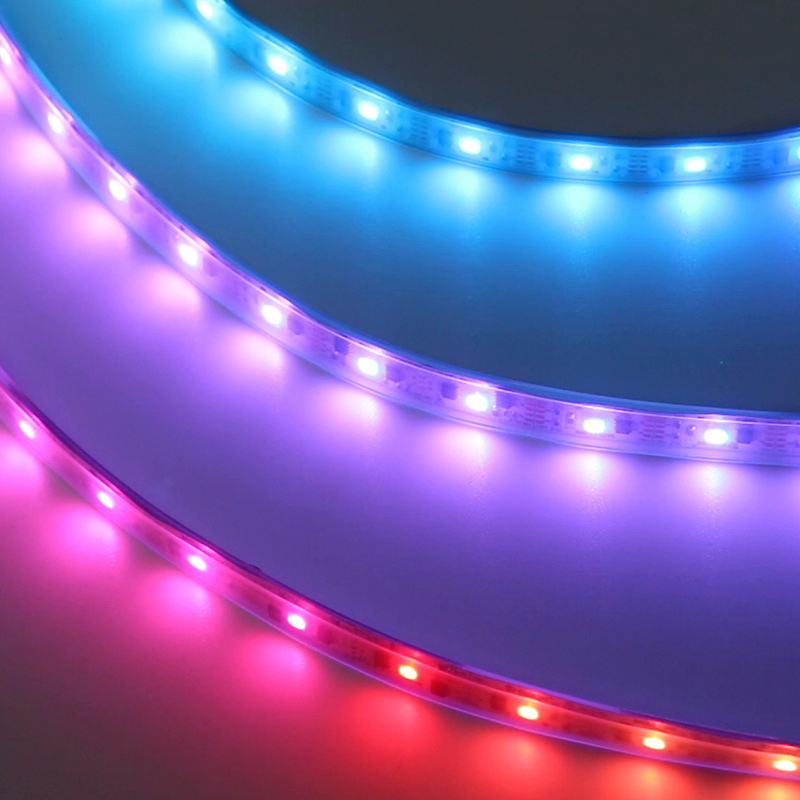 We strive to be thought-leaders in out industry and always keep our eyes and ears on what is trending so that we can keep the perfect products available for our customers. Natural items such as marble, granite, or woodgrain are not just limited to the “permanent” items in your kitchen. Fall is the perfect time to begin to bring the outdoors in with your home accents. 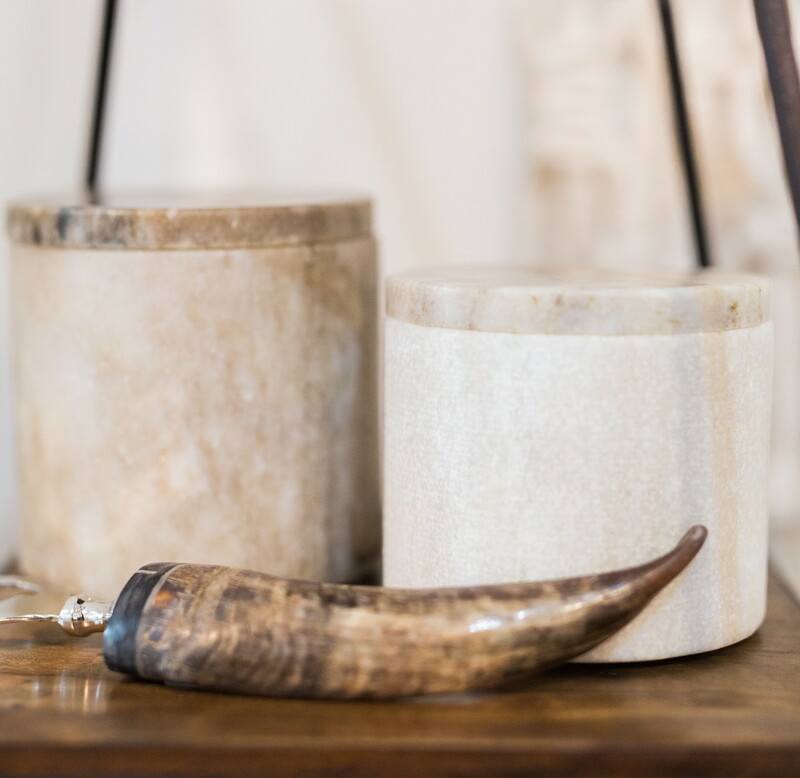 The canisters shown above are made from a gorgeous marble and that horn? it’s a bottle opener that you will never have to go searching for because it is cool enough to leave out layered as part of your look. As you prepare to entertain for these Autumn weeks ahead consider giving your kitchen a whole new look by swapping out that accessories layer in the space. If your kitchen is looking tired, clear everything off of the counters and shelves and challenge yourself to try a new look. You will be amazing at what a new rug or set of canisters can do to jump-start this process. Nervous about this trend of mixing metals? Kitchen accessories and wall art are the perfect way to dip your toe in and test the waters. Copper is a fantastic Fall color and it happens to look right “at home” in the kitchen. These vintage canisters from mabel. 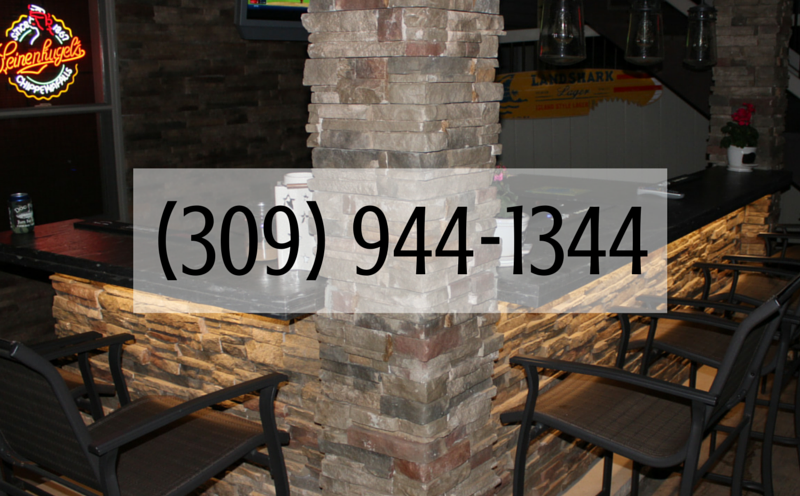 in Geneseo, IL would pair up quite nicely with the marble set shown above. Mixing metals with other textures can be fun. 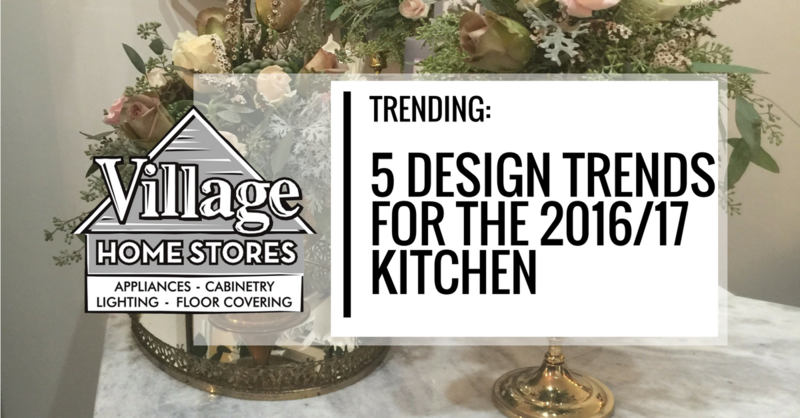 If you are ready to dive into a more exciting look in mixed metals, your designer at Village Home Stores is ready to help you balance and visualize the finished space. 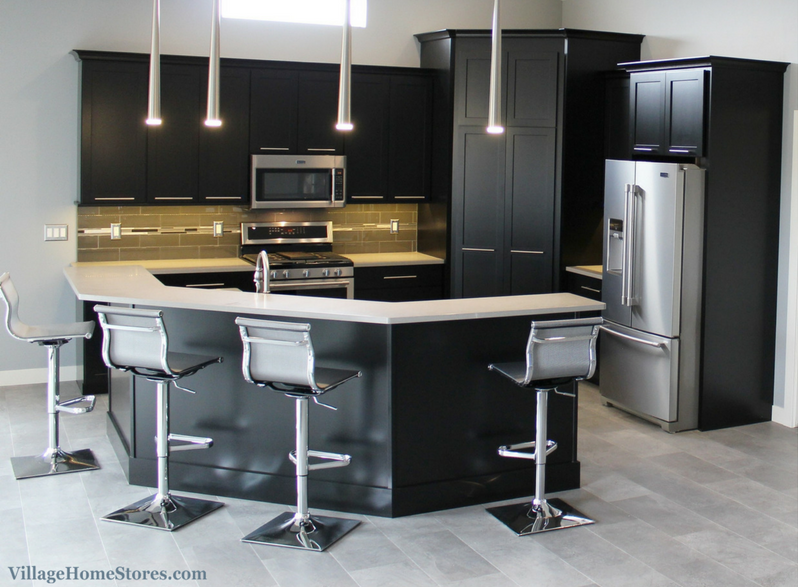 Take a look at this kitchen featured recently on the blog. This completed look is polished and complete and includes 4 metals finishes in the design! KitchenAid’s Black Stainless and Standard Stainless Steel appliances are paired with Hammered Copper sinks and Oil -Rubbed Bronze faucets. See the complete album of photos from this project here on our Houzz.com page. Gray continues to become the new neutral choice all across the board. We were gracious to attend Dura Supreme’s Design Symposium again this year and many of the trends they spoke of last year were still atop the list for 2016/2017. Last year we blogged on how Gray is here to stay. Take note that this “trend” is one worth your consideration for your kitchen or bath project because it is forecasted to stay on point for the next 5-8 years. 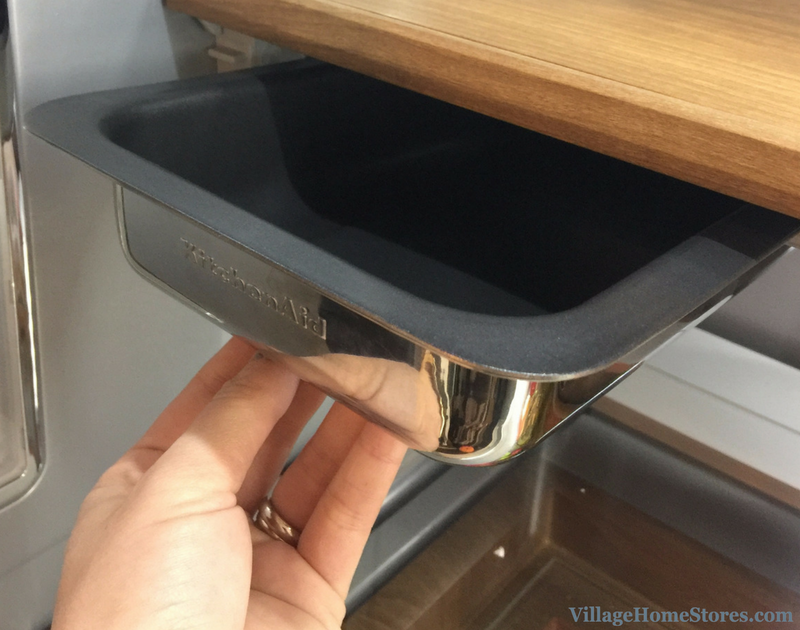 At Dura Supreme’s Design Symposium we were shown a beautiful new finish combination that really reflects the direction of the Modern Farmhouse look that is evolving into a very polished concept. 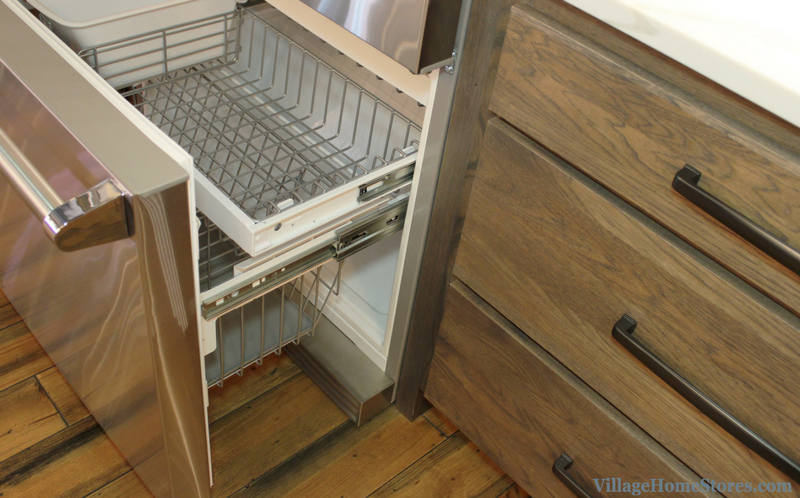 The “Farmhouse” look is no longer limited to a barn door and an apron-front sink. The polished Modern Farmhouse look has evolved to include many of the trends we are touching on in this post including warmer grays, natural details, and mixed metals. Dura Supreme Hickory Morel finish available at Village Home Stores. 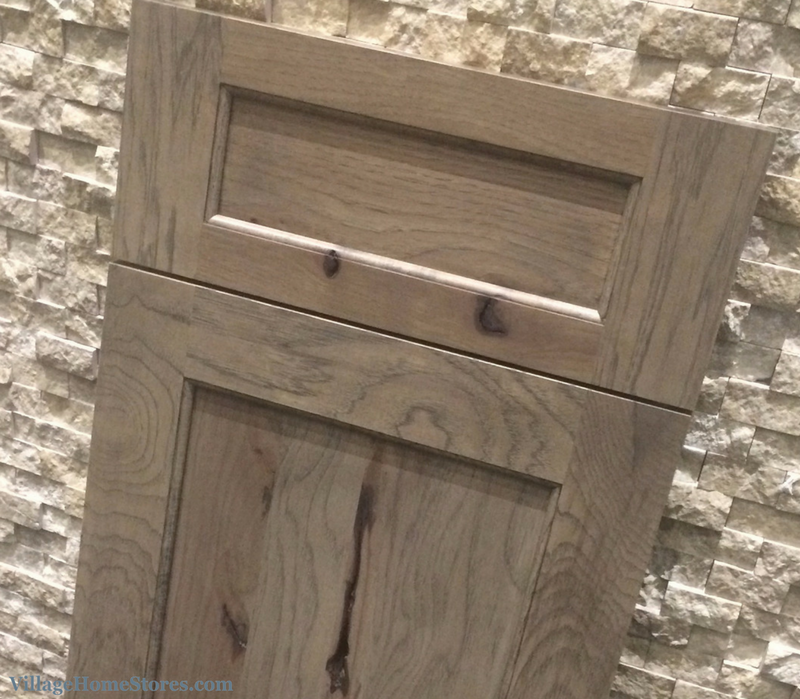 The “Morel” stain shown here on a Hickory door is a Gray/Brown Undertone finish that allows the natural characteristics of the woodgrain to show. With so many of our projects now including an accent island or cabinet in some area of the design, this wood finish is a great option. 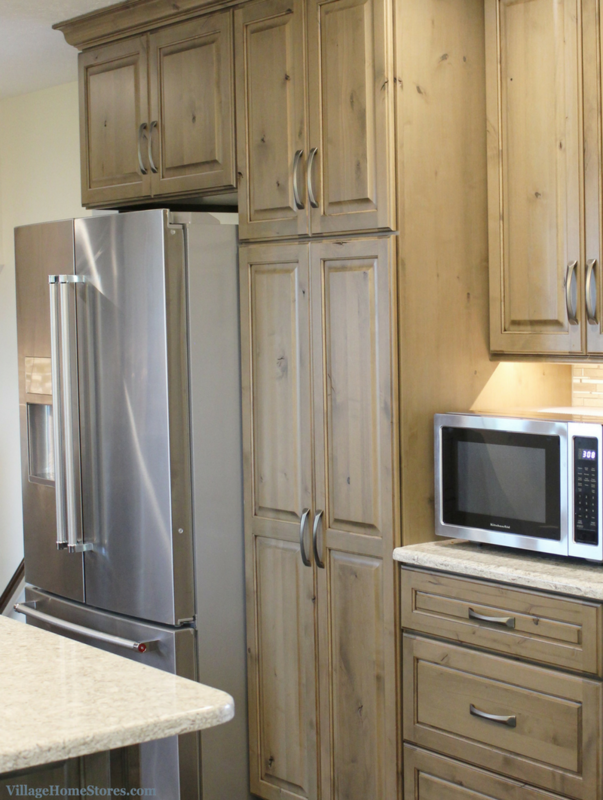 If you are considering including a “cool” or a “warm” painted finish to combine with your wood cabinetry, “Morel” pairs perfectly with each concept. So if Gray is the new neutral, what should I pair it with? Our short answer… all the things! An important point we want to make is that because we are seeing Gray used throughout the home, the “cold” and “drab” gray you are picturing is not the Gray you are after. 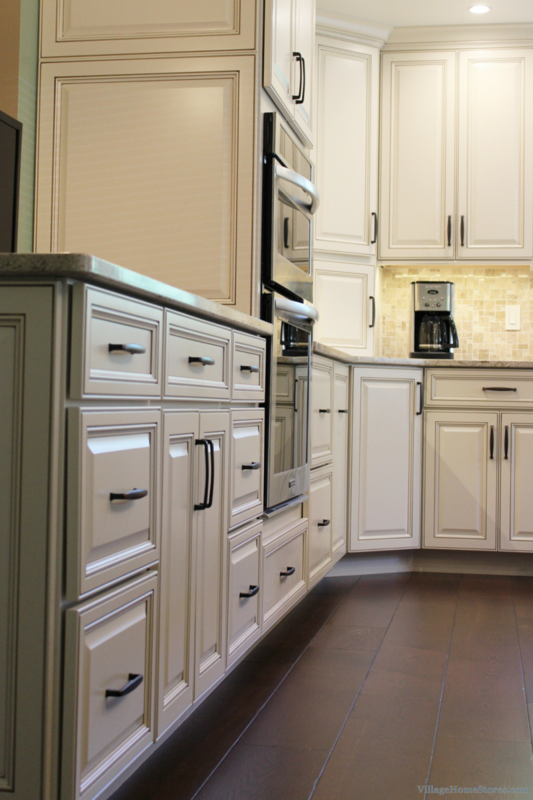 Warmer tones of Gray are most commonly found in cabinet finishes, paint colors and home decor items. These warm Grays pair amazingly with woods ranging from light to dark. 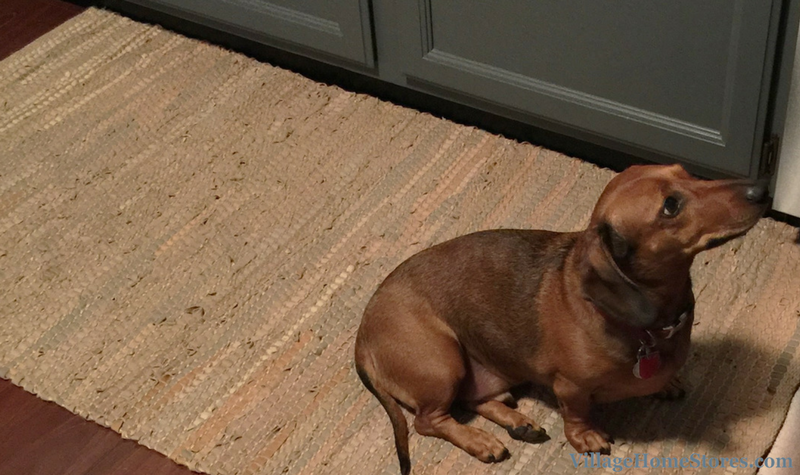 Desmond the Dachshund models a leather woven rug from Katsch. Selecting warmer Grays and pairing with a rich woodtone also lends itself to including many of the other design trends we are suggesting. Including natural items (see our first suggestion in this post) is easy when a warm Gray is in the mix. Natural fibers and materials include a variety of colors in a piece. We snagged this great rug the day of the event from Katsch and it makes for a perfect kitchen sink rug. Natural rope is woven with Gray leather strips. It is unique, comfortable, and stylish. See more great examples of Gray used in beautiful spaces on this Pinterest Board we have curated. Adding mirror to your space can be a real game-changer when you are looking for a whole new look. A quick change can be to swap out one piece of wall decor for a framed mirror. 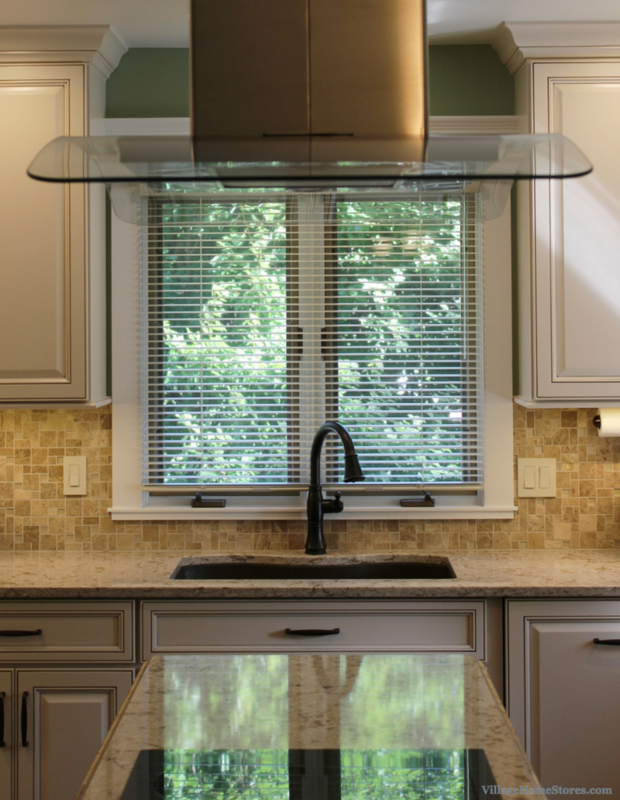 If your kitchen sink is not beneath a window add a mirror above your sink! This can also be a great way to play around with mixing metal finishes. 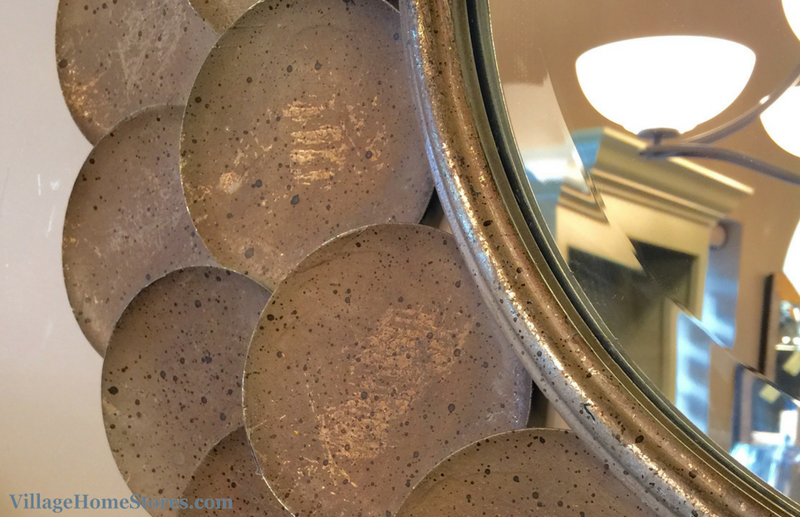 Challenge yourself to choose a framed mirror different from your faucet or cabinet hardware and repeat this new metal finish someplace else in the space. We carry many framed mirror options in a variety of styles. Swap out some artwork for a mirror in your kitchen or bath. 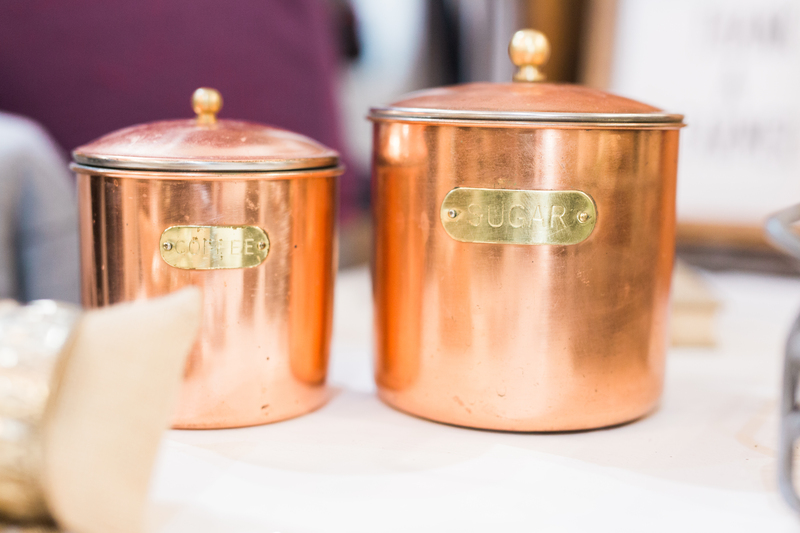 At the Tastemakers event we saw antique mirrors used as trays and clear glass accessories were proven to be versatile pieces you can use all year round. We recently blogged about a kitchen that included mirror inserts in place of glass and it bounced light and beautiful countryside views all around the space. A creative surface to play around with mirror is in your kitchen or bathroom tile. Stop by our showroom to see some of the many fun options we have that include mirrored accents in a variety of colors and styles. 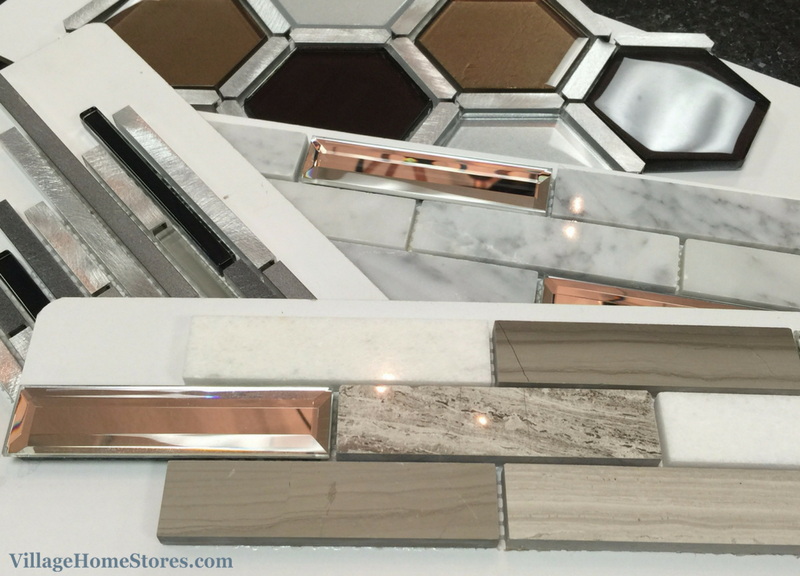 Mirrored tile for your kitchen or bath from Village Home Stores. If you are wanting to give your kitchen or bath and update consider one or more of these suggestions. Many of them can be done right now possibly with items you have already! If you need some new pieces to use, shop Geneseo, IL for these great looks! If you are wanting to start completely fresh and create a space in your home on trend and complimentary of your own personal style we want to help make that happen! 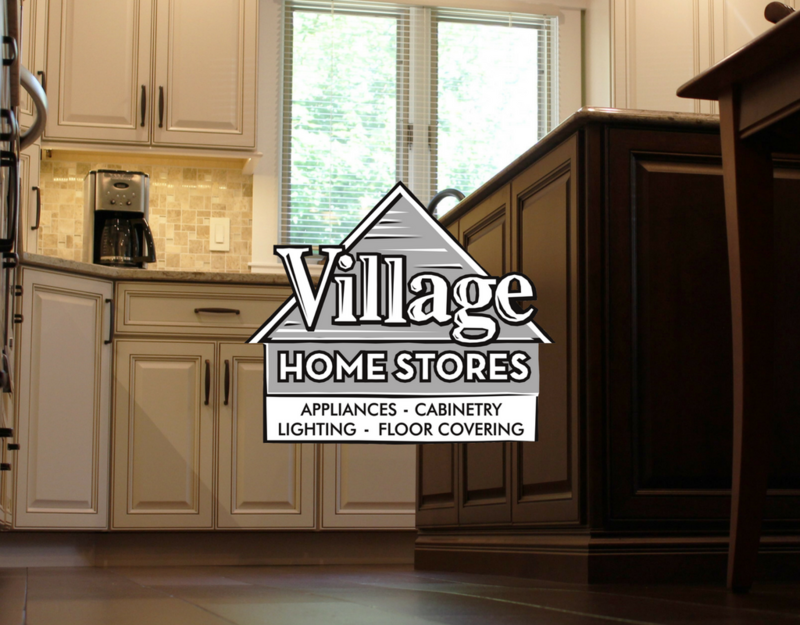 Contact Village Home Stores today to start the conversation about your own project. Our thanks to Katsch, Designs on the Boulevard, and mabel, for hosting the Tastemakers Tea event. The setting, the conversation, and the company was all inspiring! What a great way to kickoff this beautiful Midwest Fall Season! What is it about some projects that really help push them over the edge into that “magazine-cover” category? Many times is that added layer of details that take a great looking design and amplify it into gorgeous! 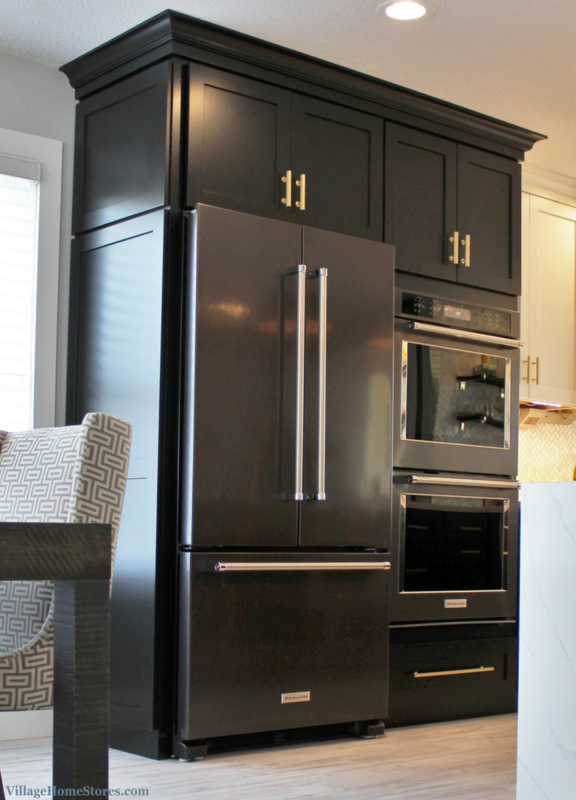 In the case of this remodeled Moline kitchen, the details make the design! 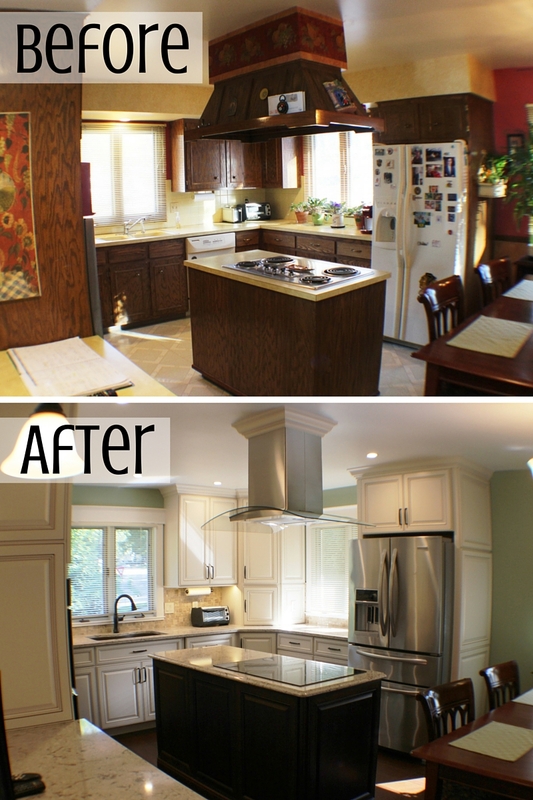 This Moline kitchen has been completely transformed. From dark and dated to bright and timeless. 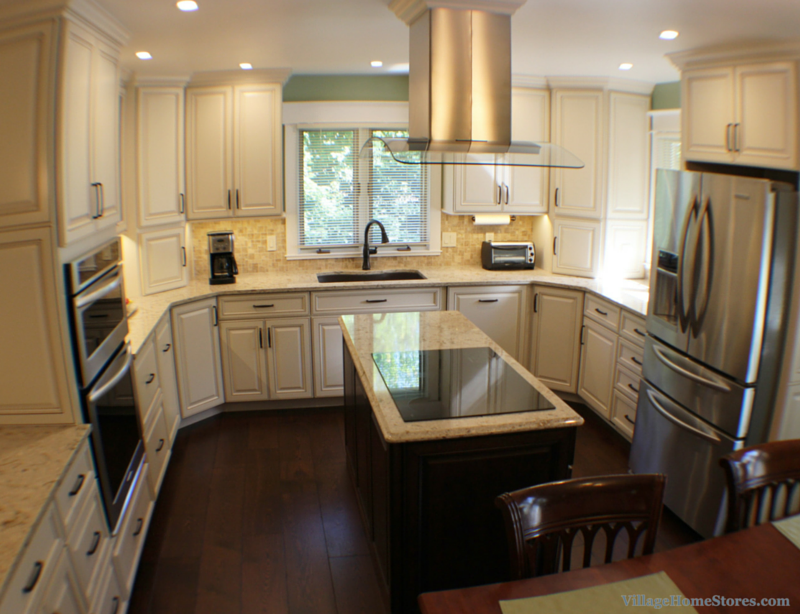 Dark oak cabinetry and golden laminate tops gave the original kitchen a very crowded feeling. 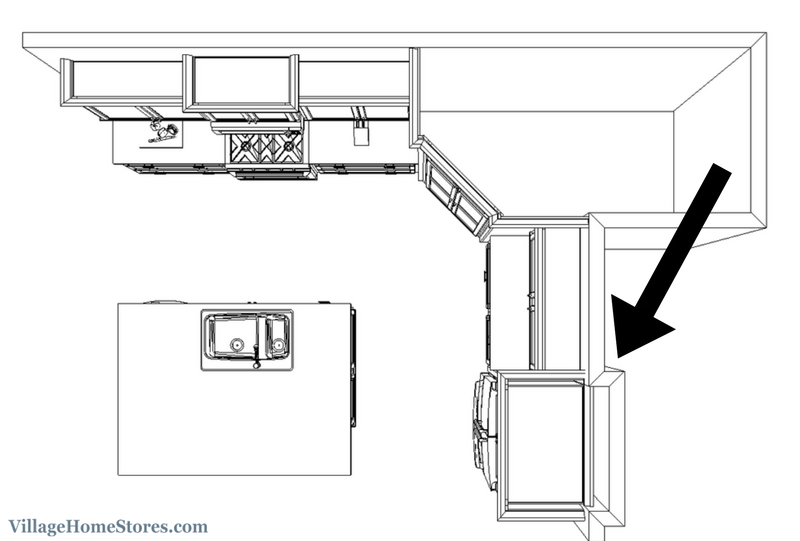 An island located in the center of the kitchen was accessible from all sides but a large wood hood suspended above it seemed to crowd the space. 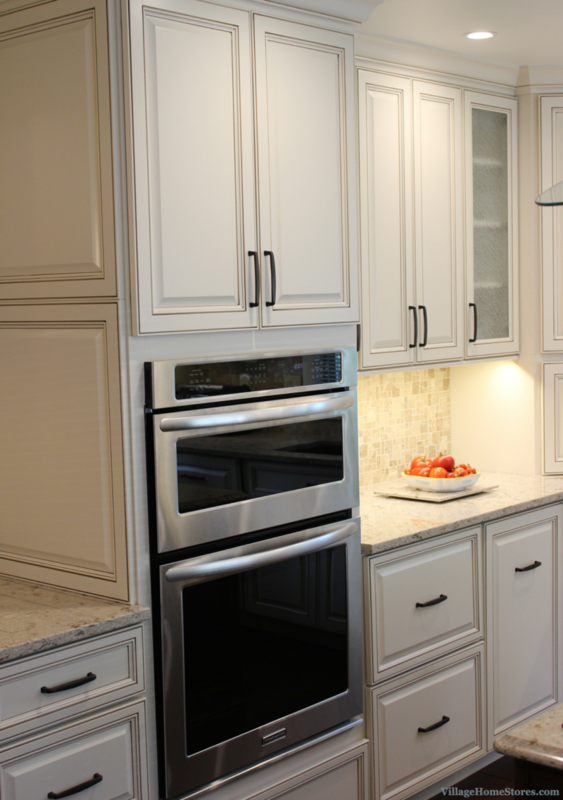 The newly remodeled Moline kitchen has not just been updated but now gives a more timeless traditional look. A similar footprint to to original kitchen but upgrades to function and styles throughout. Brightening the kitchen materials and replacing the massive wood hood with a more subtle style keeps the new kitchen feeling open and airy. Removing the soffits above and allows the new cabinets to extend up to the ceiling. The cabinetry and counters are not all that were ready for a change, the kitchen appliances were very ready for an update. 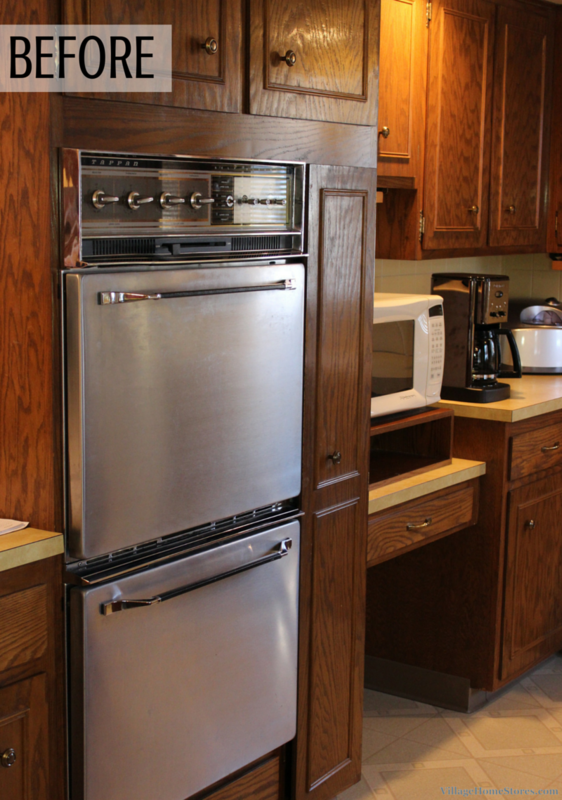 A brand new appliance package from KitchenAid was installed into this new Moline kitchen. Notice how the original wall oven didn’t even have a glass-front door to see inside of the unit? What an upgrade they have made here! A combination microwave and wall oven allow the convenience of a double oven when needed but also standard microwave features in the top unit. A perfect pairing of Cambria’s “Windermere” quartz design with Koch’s painted “Pearl” finish and a “Umber” highlight. This bright finish gives the new kitchen an open and airy feeling from the original dark Oak cabinetry that was removed. 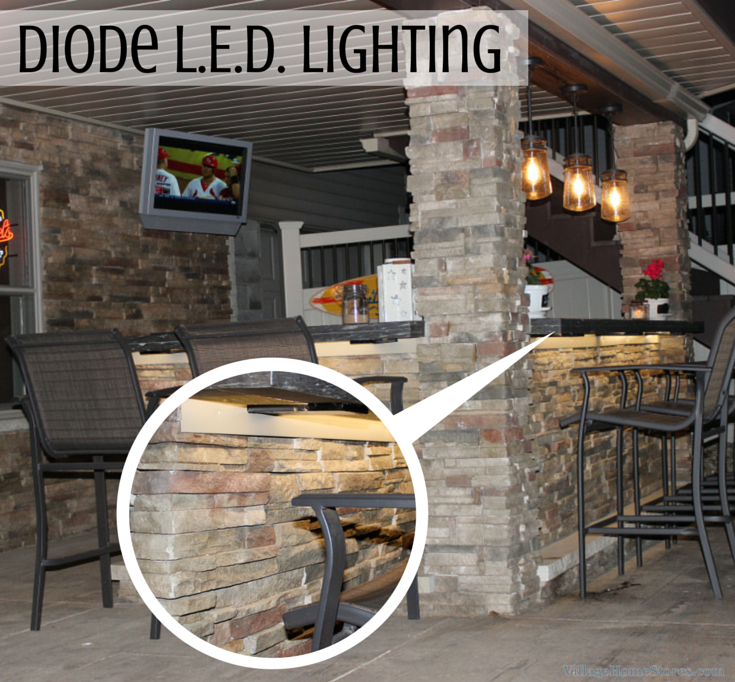 Our Diode LED undercabinet lighting helps lighten the space as well. With a smooth wash of light that is dimmable and energy efficient, this system is the perfect task and ambient light in a kitchen. 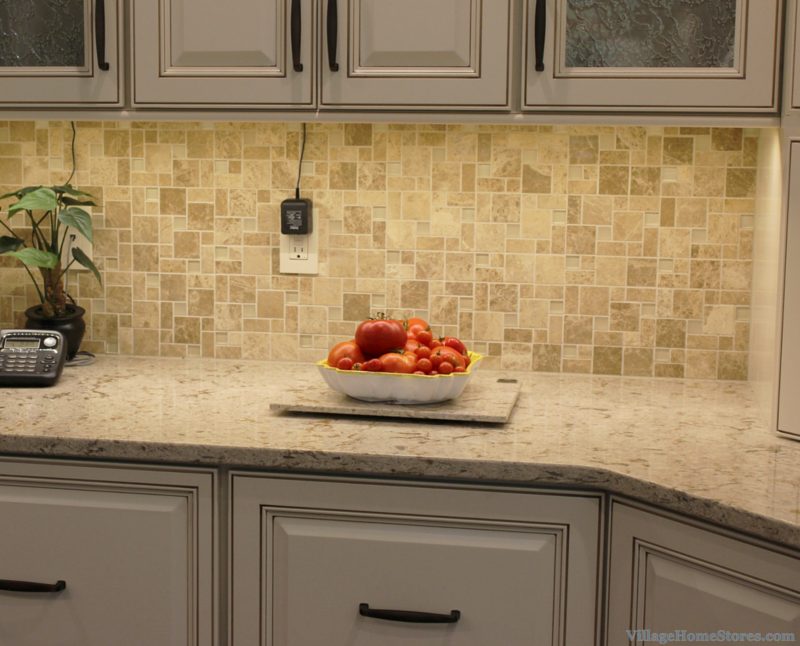 Let’s begin by showcasing the details you would expect in a Traditional kitchen like this from Village Home Stores. 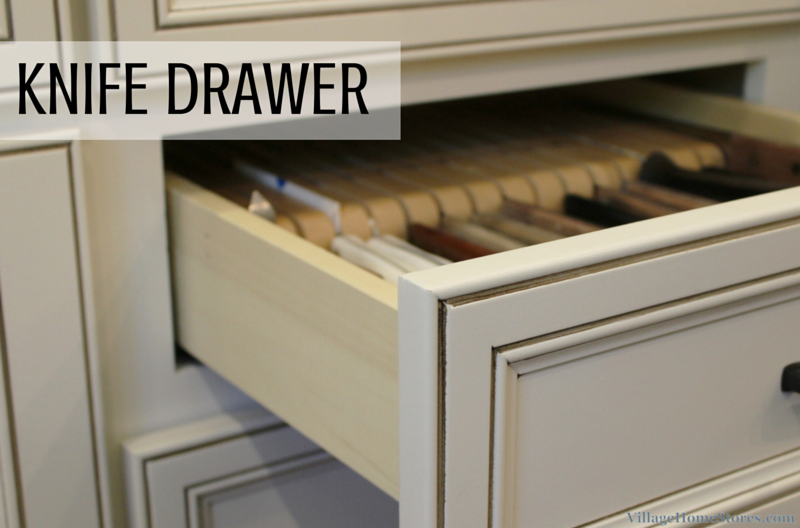 Elements like these are many times not included when working with a “Big Box” cabinet store but any professional Kitchen & Bath showroom should offer you these design details. 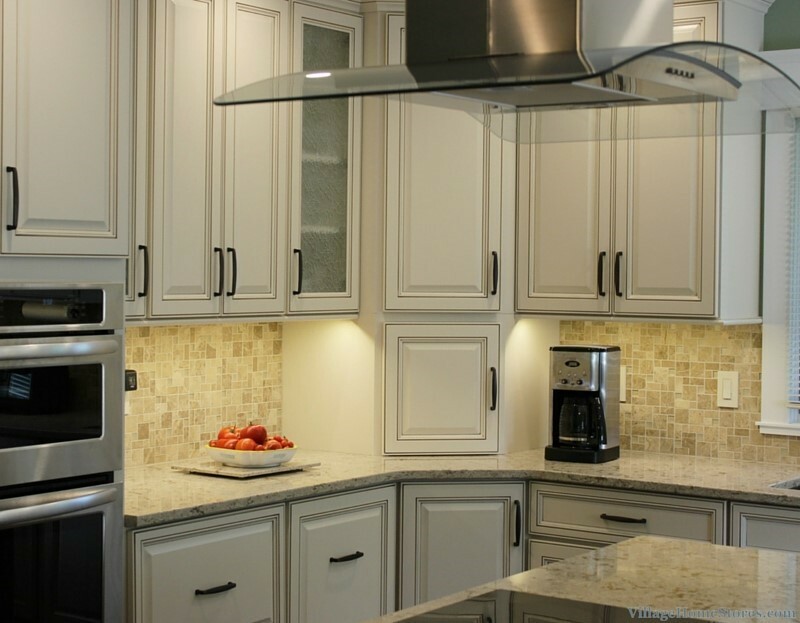 Crown molding is a key element in giving your kitchen a polished off look. In this case, a traditional crown bridges the gap from above the wall cabinets to the ceiling. Paying attention to scale and size is important here. Cabinet and ceiling height as well as other molding details in a home must be considered when selecting size. Varied depths in this kitchen make for an interesting look and the opportunity to continue the same crown but add interest to the detail. 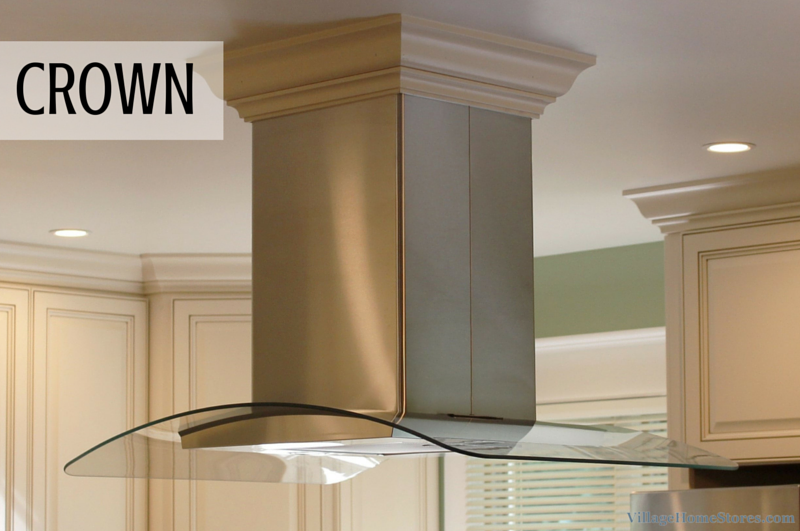 Notice how the same wood crown has been wrapped around the top of the new stainless hood for a look you wouldn’t expect to see. 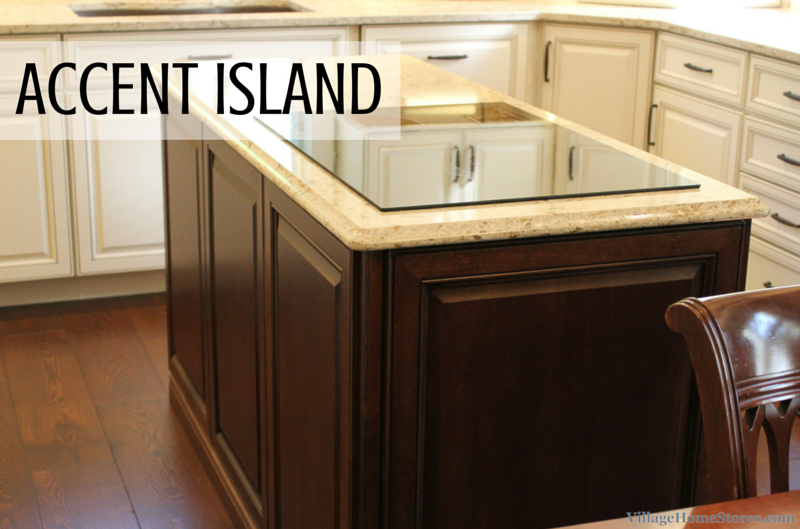 Accent islands in a contrasting color have become more and more common in new kitchen designs. The “Mocha” finish on this island compliments the wood flooring and the highlight glaze that has been applied to the perimeter cabinetry. 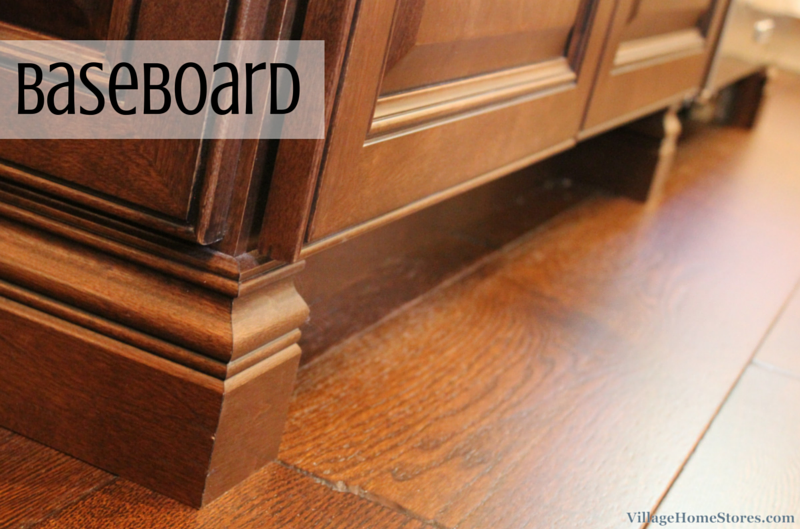 Baseboard molding wrapped around an island or end panel treatment can offer you and instantly polished look. 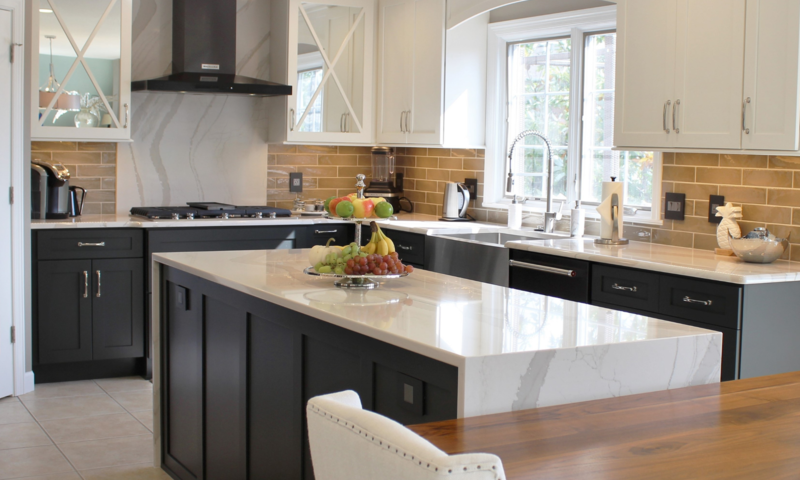 The right installer is key when you are looking for a totally polished Traditional style kitchen. Your finished look will come to completion with that final layer of trim and moldings. 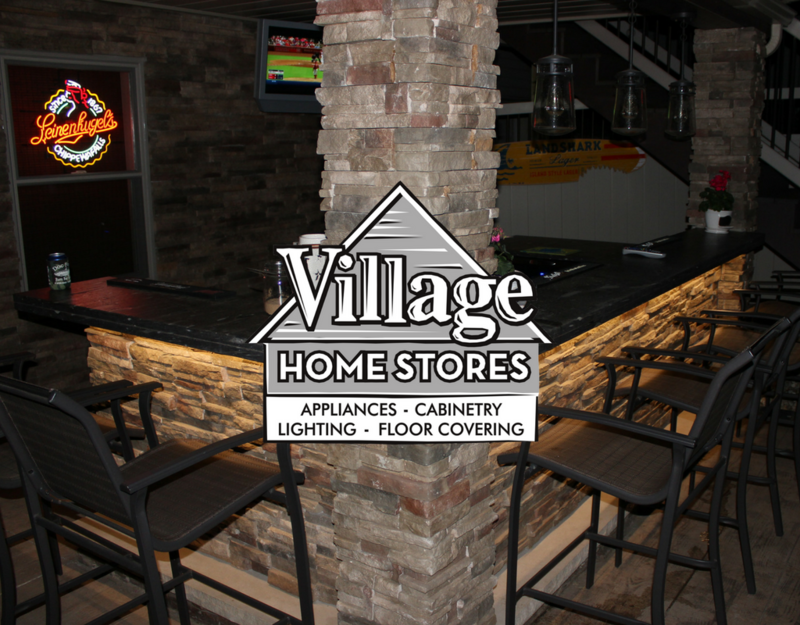 Don’t forget that Village Home Stores offers full Project Management and can schedule a carpenter for your project. If you have someone you are working with, be sure that they are skilled in millwork and trim. Never be afraid to ask to see some past work or get a recommendation from a recent project. 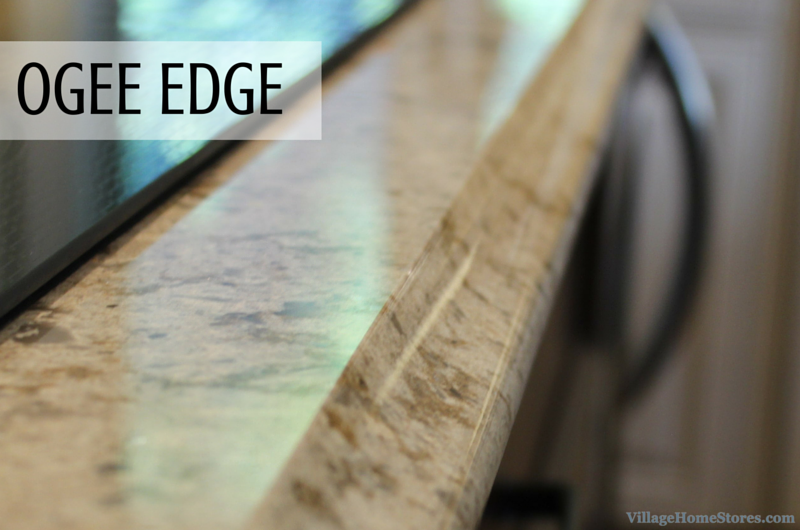 A standard “Eased” edge profile is the most commonly used edge profile on stone countertops. 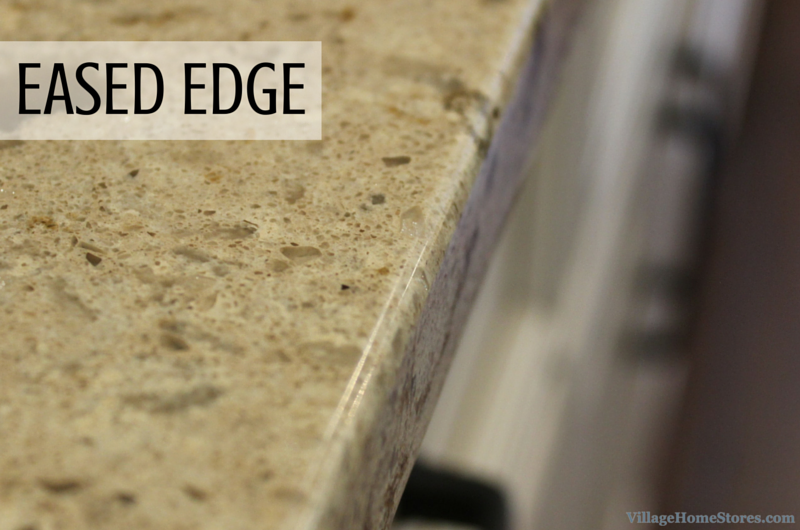 Many times this edge is selected because it comes with no upcharges to apply to your stone. In reality, the “Eased” edge is sometimes the best look for the overall design. Clean and simple lines always can find a home in any style of kitchen. Here it helps from distracting from the door details the “Royale” style from Koch includes. Now for those details that make the design. The ones you may not expect to see but that bring this kitchen design into that “magazine cover” or “Pinterestworthy” category. These details are why working with a professional can not just save you time and money but give you the end result you want! 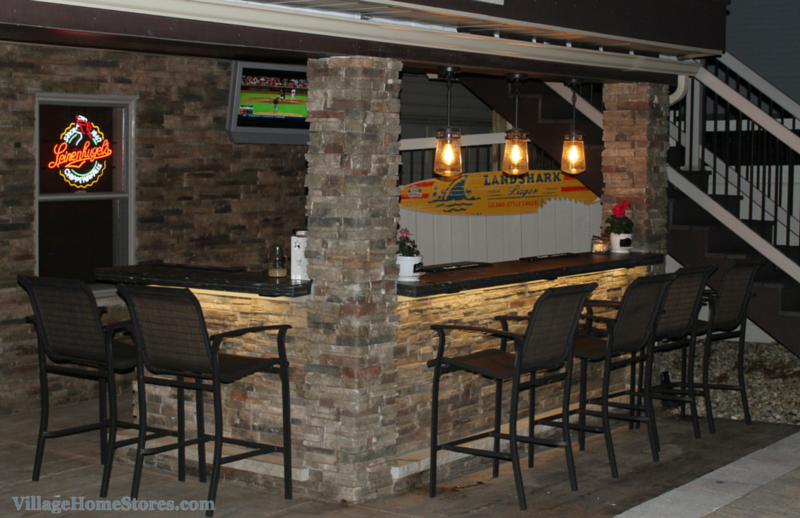 The accent island is not only an accent color but it is framed in with an accented edge profile. 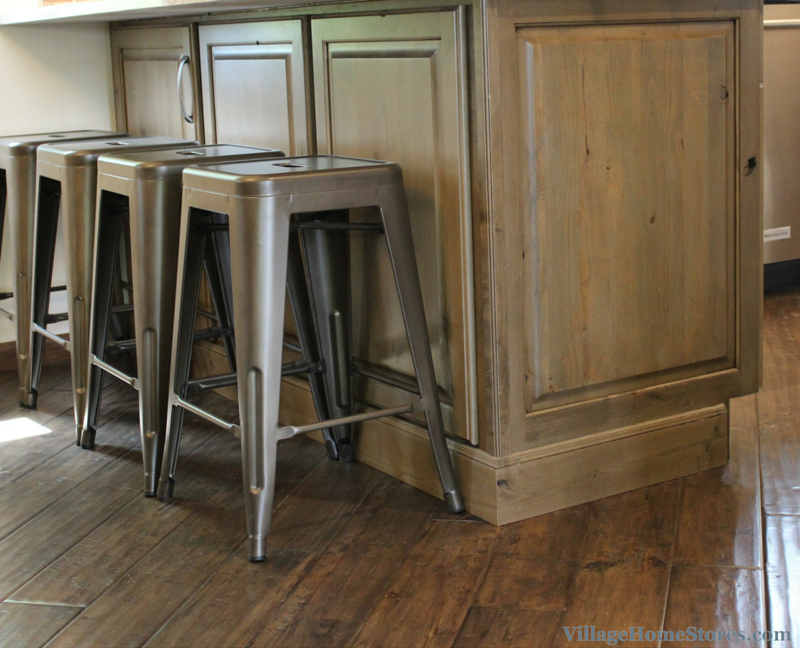 The “Ogee” edge profile has been added onto all four edges of this kitchen island. Right at the center of activity and much of the attention to any guest, this detail helps give the island a furniture look. Light from the windows and the kitchen lighting highlights the edges perfectly. In that same island is a glass-front beverage cooler. 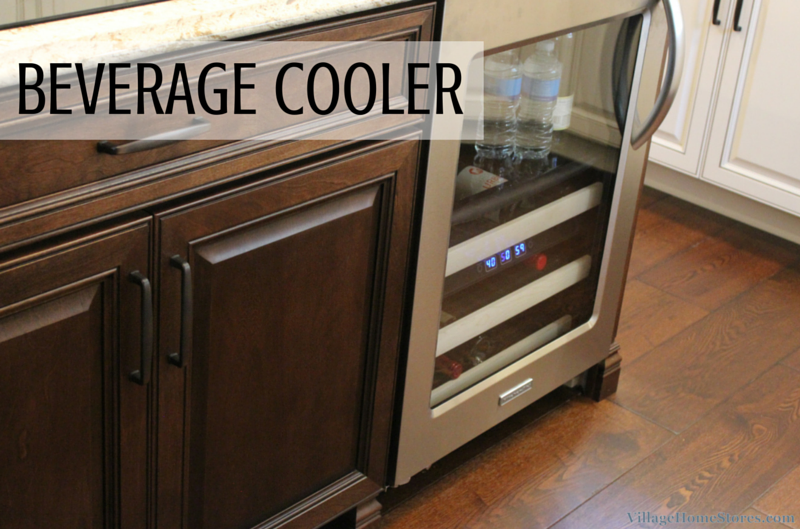 This keeps beverages easily accessible to guests and frees up space in the main refrigerator for other items. Also notice how the trim carpenter framed in the baseboard below to help keep the built-in unit looking at home in the furniture style island. 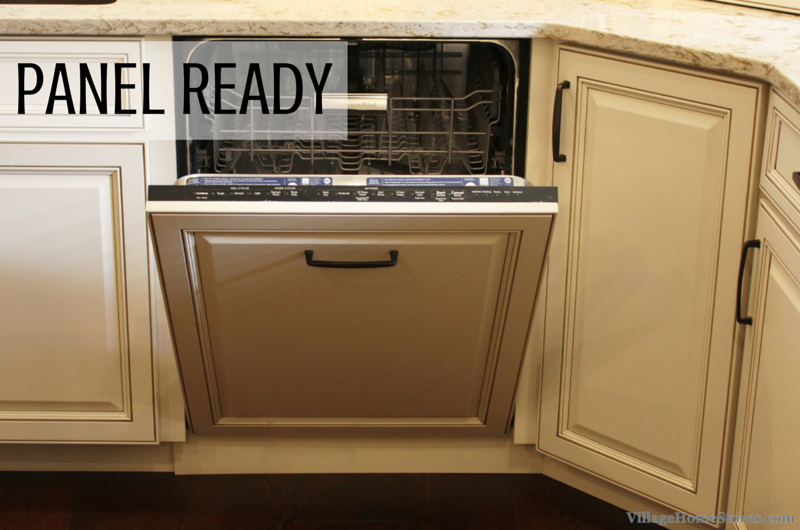 Panel-ready appliances like this dishwasher unit are always a great choice when you want to include designer details in your kitchen. 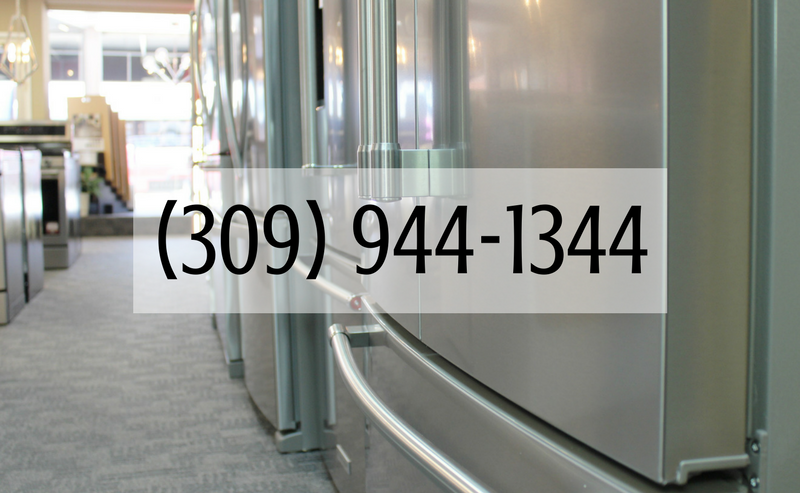 Refrigerators, beverage coolers, dishwashers, and icemakers all can be ordered in panel-ready models. 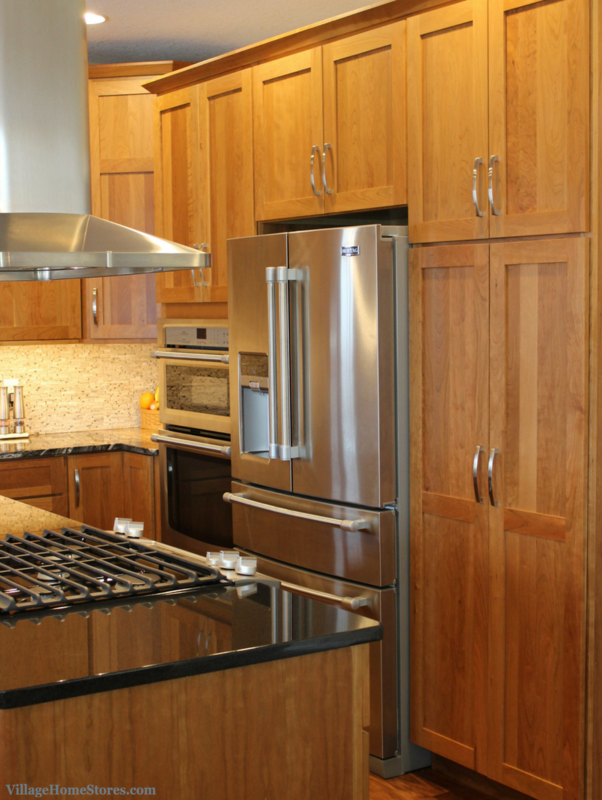 Speaking of panels, notice how there are no basic, smooth ends or back to any of the cabinetry in this Moline kitchen? 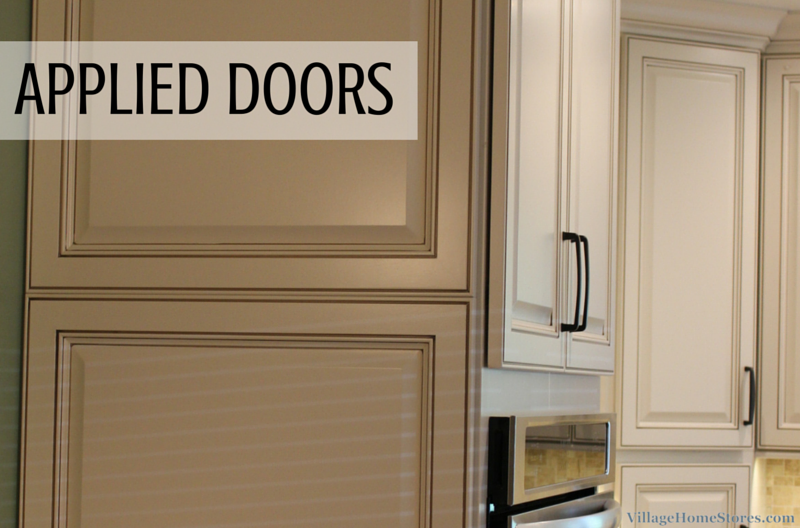 Applied doors have been added to all of the exposed ends in the design. The back of the Peninsula that faces the adjacent Dining Room also has custom panels applied. 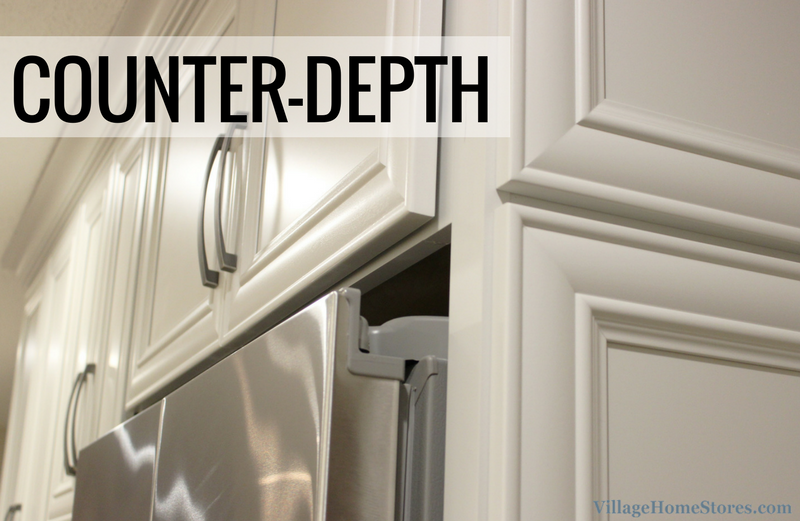 These exposed ends are an opportunity to give a custom look to your kitchen. Some of the design details and upgrades in this new kitchen you can’t see unless you are using this kitchen. 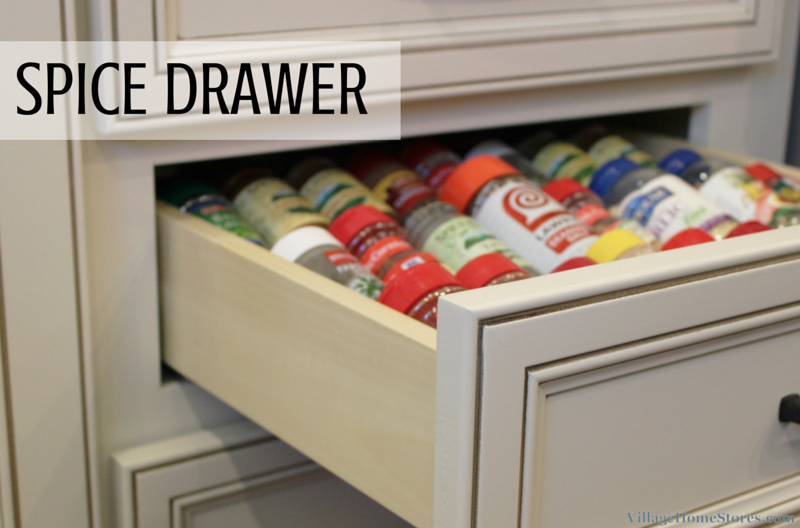 A spice drawer organizer is located in a stack of drawers below the window. Above that spice drawer is a knife block drawer. These modifications and inserts can be added anywhere in a design. 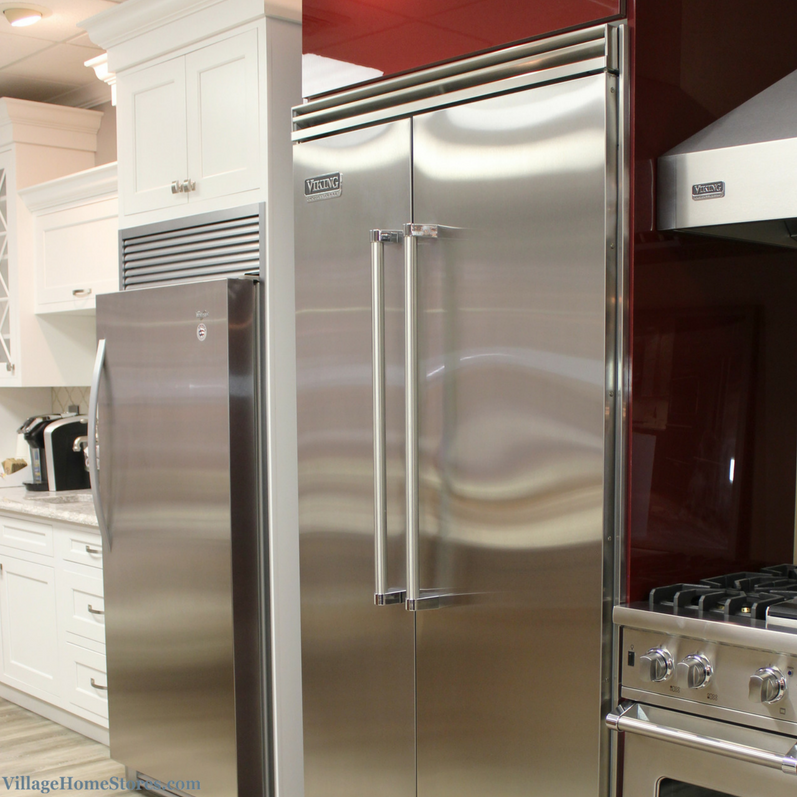 Your designer at Village Home Stores can work with you to find the perfect locations and modifications for your lifestyle. The kitchen sink is right at the center of all activity in the new kitchen. A beautiful E-Granite sink has been undermounted to the Cambria quartz tops. This sink is truly the best of both worlds. 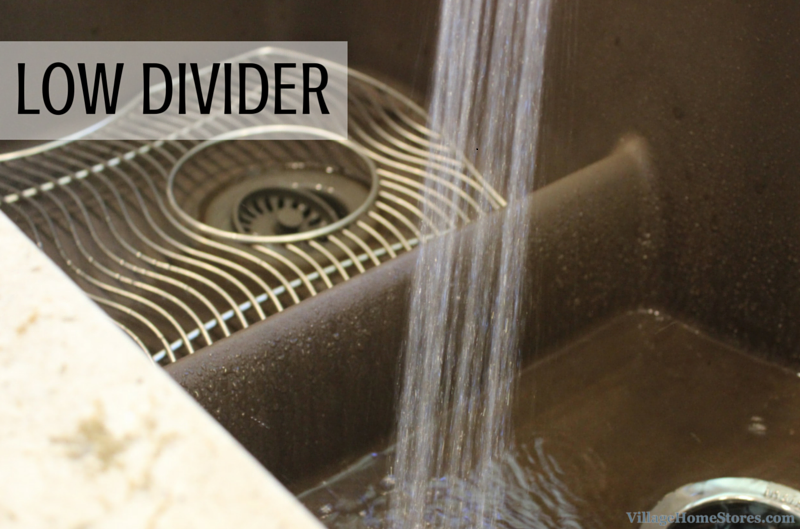 A low divider undermounted sink has the benefits of a single and a double well layout. The option to fill one side when a shallow soak is needed for washing but the space for larger items when needed. This Moline kitchen is not bright and airy. What sets it apart are the details. Details really do make the design. 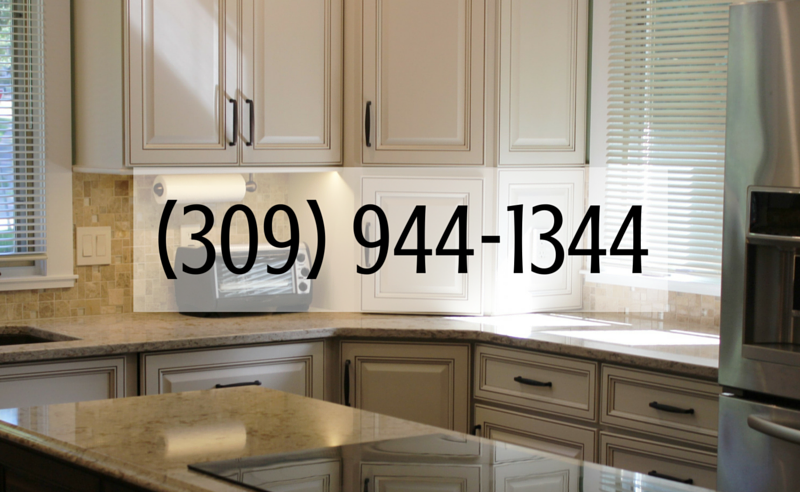 Want your dream kitchen but haven’t found the right design team to trust your home with? Village Home Stores is ready to help build you the perfect team and design for you. 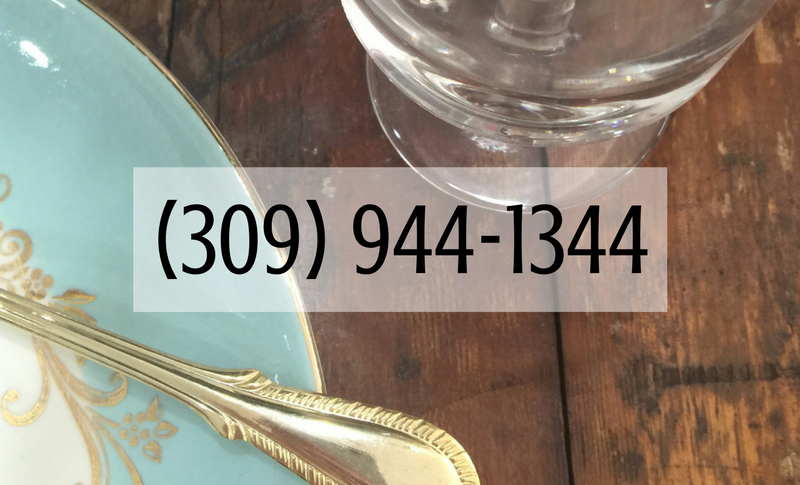 Call or click today and let’s get started!